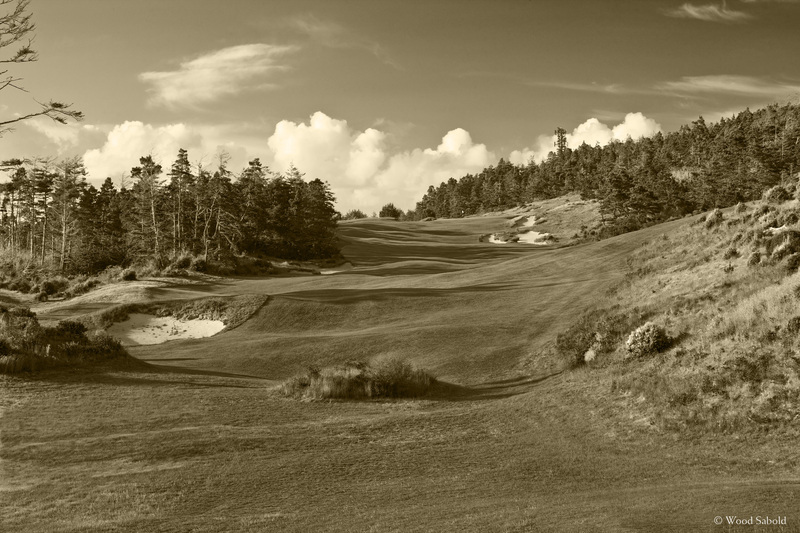 This sepia toned image shows the hole’s full frontal view from the tee of the uphill par 5, 16th hole of the Bandon Trails Course of the Bandon Dunes Golf Resort, Bandon, Oregon. The second shot on this hole has to avoid the bunker complex on the right. The green sits up on a plateau and the details of the green can only be seen from approaches less than 75 yards away. Local knowledge of the green’s contours is important to avoid approach shots diving to the left into a series of small bunkers after thinking a shot played to the middle of the green would end up safe. Bandon Trails is the third course of the acclaimed Bandon Dunes Golf Resort. The course opened in 2005. Architect, Bill Coore and Ben Crenshaw.